Few days are spent hiking or warming-up in the fantastically eroded valleys of Cappadocia, million years ago nature began to form the area and that is still going on. From that time, the canyons, plateaux, valleys and most of all the Fairy chimneys became the symbol of Cappadocia. During our walk we follow old paths to visit the rock-cut churches, monasteries and cave dwellings, all of which are set against a textured moonscape of bizarre volcanic erosions. After that we’ll embark on a challenging and adventurous 3-days trek through the Taurus Mountains towards the rich and fertile plains of southern Turkey. The high meadows or pastures are inhabited by semi-nomadic groups during the summer, in the months of June to September - in particular, by the yoruk, who are Turkoman in origin and whose traditional occupation is grazing their goats and sheep. 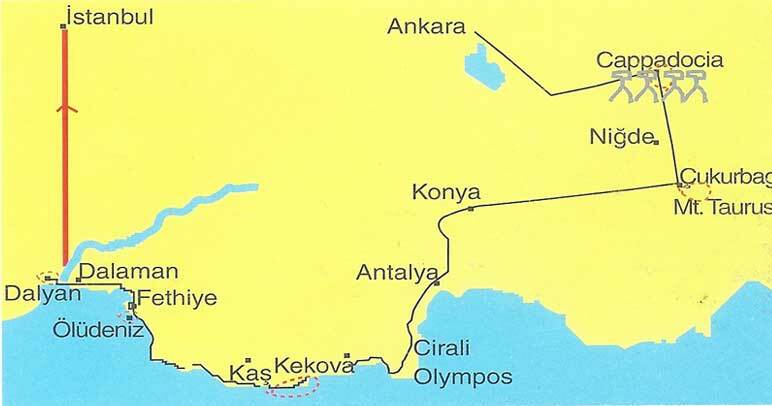 After Taurus part , we drive to beautiful coastal area of the Turkish Mediterranean, known as Lycia . Fragrant pine forests tumble down a back cloth of mountain slopes to end abruptly in red cliffs, secret coves and sandy beaches. With its excellent climate, guaranteed sunshine, this delightful coastal offers to spend holidays sailing in a culture, history and nature combining area. Meet at the airport and transfer to hotel for overnight. Early in the morning we'll depart by road to Cappadocia, 4 h driving, via Tuz Gol, the great Salt Lake with a superficies of 1700 m². Then we'll get into the surrealistic moonscape of Cappadocia with its rock carved churches monasteries, another features which few visitors are aware of. We begin our 2 h trekking in the red valley, a fairy land where wind and rain have made appeared the different red coloured layers of volcanic tuff. . Overnight at pension in Goreme. We trek thorough the Akvadi (white valley) eroded so perfectly by time, rain and wind during centuries. On our way following a seasonal river, many strange curious rock formations and fairy chimneys round us. If we are lucky we can also see some wild birds. (like hoopoe) and some wild animals(like fox). In 3h walk our way gets us up to Uchisar village where we have lunch break in a restaurant. Uchisar village is settled around a high promoter Uchisar citadel, the highest point in Cappadocia, offers a stunning panorama of the Goreme Valley.. In the afternoon we follow a path to the Pigeon valley, and we will see some pigionaries that is holy for Moslem people. Overnight in pension. Our final walking day in this region is spent walking in Pasabagları, known as the valley of the Priests. Many of the chimneys here are only partially divided, showing us the continuous erosion process. Interestingly too there is a small minaret transformed from a church belfry indicating that this place was inhabited by Moslems after the Christians. After walking we will be transferred to Demirkazik village, the trailhead village on the skirts of Taurus mountain.. Diner and overnight at wooden village house in the village that will give us to contact with local people. The day is to enjoy the spectacular scenery of the northern face of Mount Demirkazık (3756 m). More impressive scenery as we trek through the impressive Cimbar Canyon. We’ll contact with the habitants of the village whose lifestyle hasn’t change for centuries. 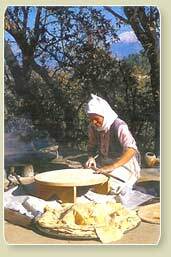 It may be possible to observe some women, spinning their wool and working on their looms. We arrive at Sokulupinar camp site on a footpath. 5 hours walking. Departing our campsite we descend Oluksekisi, before descending down again to the high pastures of the Eznevit yaylası (2538 m). Depending on the time of year, we may encounter the semi nomads of this area grazing their flocks. After lunch we gradually descend to our campsite. Dinner and overnight at campsite. Through valley and hills we follow the paths sloping down to Alaoz, a rather rustic settlement .After a tea-pause in a local tea-house, in order to meet the population of the village, we drive to Konya city the official capital of Seljuk empire 12/13th century. Overnight at hotel in Konya. In the morning, we visit the Mevlana Dervish museum with its dome turquoise tiles. The museum was originally a monastery and is still a very holy place – home to the Whirling Dervishes and containing the tomb of their founder. After visit we drive to Antalya principal holiday resort of Turkey at the Mediterranean sea , is an attractive city with shady palm-lined boulevards. Kaleici where we will stay is narrow, winding streets and old wooded houses abut the ancient city walls. Dinner and Overnight in pension. In the morning transfer to Cirali, Known by the local inhabitants as the " burning mountain " (Yanartas), it is a result of escaping natural gas, whose flames have been shooting heavenwards for centuries. Our trek will continue from the path that will take us till Ulupinar village. We will be transferred to Cirali .Overnight pension. In the morning transfer to Kekova village (2h30). This place is declared forbidden protected zone to the construction and remain a town fishers and agricultural by the sea. Here taking a small boat, we have opportunity to discover the region of Kekova through crystalline waters a swallowed up city, and then visit citadel of Simena, been founded to the IV th. century ,with a superb view on the islands and to bathe in waters . end of the day our bus will transfer us to Kas (1h.). A city charming town with seeing of Greek island Meis. Diner and overnight in Hotel. 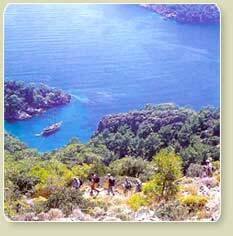 A transfer (1-2h) by bus for Fethiye. We walk to Kayakoy, the Greeks lived in till 1923, and abandoned the area because of the population agreement between the Greek and Turkey. According to agreement the governments changed the public. Picnic in the village and visit some of the churches of the 19th century. Afternoon, our path will take us to Oludeniz, an idyllic sea bay and a quiet lagoon set against a wild mountain backdrop of dense forest. Overnight pension. In the morning transfer Ekincik . We begin to walk from Ekincik village and winding through the mountainous backcountry. 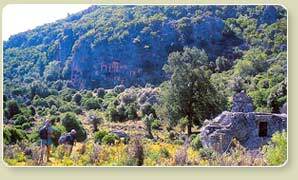 We see the old Lycian city of Caunus (400 BC) with magnificent rock tombs carved into the rock, on our way through a pine forest to Dalyan. Caunus was an ancient harbour city. From here we embark on a local river ferry to explore the Dalyan river area and Arrive to the hot spring by waterway, opportunity to swim in the natural swimming pools (hot spring) .. 5 hours walking. Dinner and Overnight in pension. In the morning transfer to Dalaman airport and fly to Istanbul. Afternoon is free to visit old part of Istanbul. A full day visiting in the old part of Istanbul was known until the first World War as Constantinople, the old capital of the Byzantine and Ottoman Empires. Nearly all the city's main sites of historic interest are in old Stamboul.. We visit Topkapi palace, Blue mosque, chapel of St. Sophia, strolling in the world’s biggest covered market, then spend the afternoon shopping or visiting sites of interest at your leisure. Overnight at hotel BB.